“Can I Give Blood?” – Blood Donation FAQs Answered! There’s only one way to celebrate National Blood Donor Month – find a blood drive near you and donate today! 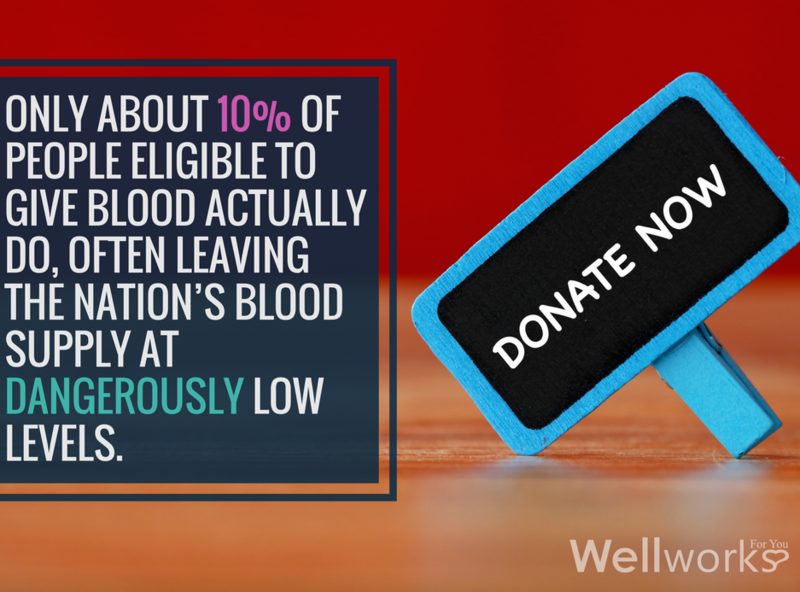 In the U.S., someone needs a blood transfusion every two seconds. According to the Community Blood Bank of Northwest Pennsylvania and Western New York, just “one pint of donated blood can save up to three lives.” The problem is, only about 10% of people eligible to give blood actually do – often leaving the nation’s blood supply at dangerously low levels. January is National Blood Donor Month – with the goal of increasing winter blood donations. Winter weather often results in cancelled blood drives, and seasonal colds/flus often leave regular donors temporarily ineligible. If you’d like to help fill the void, you may be wondering, “Can I give blood?” If you’ve never given blood before, you may be a little nervous about the process, but don’t be! We’ve got the answers to all of your questions. Am I Eligible to Give Blood? If you are in good general health, are at least 17 years old, and weigh more than 110 pounds, you are most likely eligible to donate blood. The Red Cross has a complete guide to eligibility requirements here. How Often Can You Give Blood? You can give blood every 56 days. How Do I Prepare For Donating Blood? Drink extra water before your donation and avoid fatty foods. If there is too much fat in your blood, it can’t be tested for infectious diseases, and therefore can’t be used. Remember to bring a form of ID with you to the blood drive, and wear a shirt with sleeves that can be rolled up past your elbow. Keep drinking extra water in the next 24 hours after your donation, and avoid heavy lifting. How Does the Blood Donation Process Work? A technician will privately ask you some questions about your health history and recent travel to determine your eligibility, then you will have your temperature, hemoglobin, and blood pressure checked. The actual blood draw only takes about 10 minutes. Can I Host a Blood Drive at Work? Yes! Workplace blood drives are a convenient way to support your community and help save lives. All you need to do is provide a suitable location, publicize your event and the Red Cross will do the rest! Learn more about partnering with the Red Cross to host a blood drive here. So what do you think? Are you ready to celebrate National Blood Donor Month? Contact the Red Cross to find a blood drive near you; and if you have any other questions about donating blood, get in touch with us at Wellworks For You!